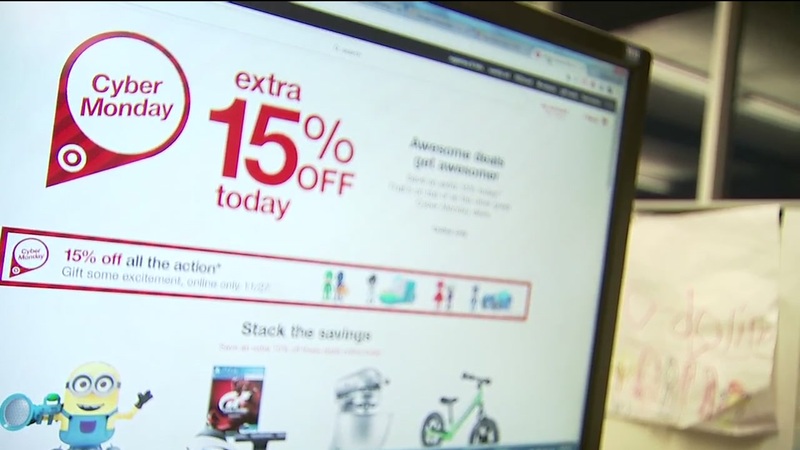 NEW YORK (WABC) -- Admit it, you're sitting at your desk at work shopping online for Cyber Monday deals. Below are some tips that could help you get the best deals possible. Research shows many consumers will sneak some items into their cart, and that may not be a bad thing! If you leave an item in your cart but don't purchase it, you may get a coupon or a discount code in a few hours. Consumer analysts said retailers are anxious to get you to hit the BUY button. Unpurchased items in your cart show your interested, but undecided -- so expect an incentive. It's not a bad idea to set up a new separate email when you shop online. Consumer expert Andrea Woroch told me last week while we were preparing our Black Friday Survival Guide at Kmart that creating a new email just for shopping will spare your primary email from tons of spam and also helps protect your identity by limiting access to private information contained in our online profiles. Social media is a great way to save money on Cyber Monday. While you're online, "like" and follow your favorite stores in Instagram, Tweet using the stores or designer name, and follow the stores or brand on Facebook. You'll often get rewarded for this by a promo code or bar code coupon sent right to your feed to use at checkout! Be wary of clicking on links offering discounts that are emailed to you, as most stores won't make it harder for you to shop and purchase by sending you a link to download. They just send a coupon or code which is ready to use. Make sure before clicking any link that it contains an "s" and the end of the HTTPS, that's the S for secure. Unsecured websites can lead into handing over your credit card to criminals. If you're not sure, always go directly to the official store website. Scam websites are everywhere! Last Christmas we profiled a grandma desperately searching for the red hot Hatchamils, which were sold out. While surfing online she came across a website offering the Egg Toys for a way cheap price, but it was too good to be true. They took her money and she never got the toys. If you're signing up to shop at new stores online, make sure you use a strong password. Use numbers and symbols to make it harder to crack into your account. Also, don't shop on public Wi-Fi, as cybersecurity expert Adam Levin with Cyberscout always warns. "Convenience comes with a price," Levin said. He had an "ethical hacker" demonstrate how a simple laptop can act as a "man in the middle" and intercept everything going between your mobile device or computer and the website you're logged onto. Monitor your accounts today for any weird activity. Cybercriminals know Monday is a frenzy and you could overlook charges that aren't yours. Sign up for text alerts. Eat your cookies! Not literally, but on your computer. Cookies are the online footprint of every site you visited. Unless you want to get continuous emails for the items you shopped for which is stored in your "cookie" or you like to keep a record of where you've been, deleting your browser history will eliminate your record and make sure your privacy isn't compromised. Advertising companies embed information into your cookies so they can target you for tailored shopping ads based on the info they collect from your "cookie"! Go to the "Tools" menu from the Internet Explorer and in the "Delete Browsing History" window check the box next to cookies. In Chrome and Firefox, on your browser toolbar, click More Tools Clear Browsing Data (or press CONTROL-SHIFT-DELETE), then click the checkboxes for cookies. Happy Cyber Monday Shopping! Don't forget many prices stick around all month, so don't feel pressured to buy Monday to get that deal.